So, I've been working on the fact that my Starfire is a bit noisy. It's been a problem with directional noise. In the last 4 hours I have discovered something. Carbon shielding paint isn't worth squat. I had assumed (yeah, we know how that goes) that applying as much of this stuff as I could in the cavity would give me at least a bit of protection. But, I finally decided to see what would happen if I created a little box out of some sheet copper I have lying around and close off some of the areas where I couldn't reach with the paint. I did that. A bit of a change. Then, I decided to check continuity throughout the cavity. Nada. The paint was not conducting anything. So, I cut up some more pieces of copper and added them to the other areas which had previously been only covered by paint. I'm starting to hear a real difference. There's still some noise, but it's cut by at least 15-20db. I still have some areas to cover and I'm going to have to come up with a good strategy as to how to reach them (the door in the back is frankly too small. I should have been far more adamant in designating the size cutout I wanted back when I had it done in 1996. Thing is, the guy did a lovely job. Just too small.). I've spent the last 18 years thinking I had at least a minimal amount of shielding in there when I in fact had none. 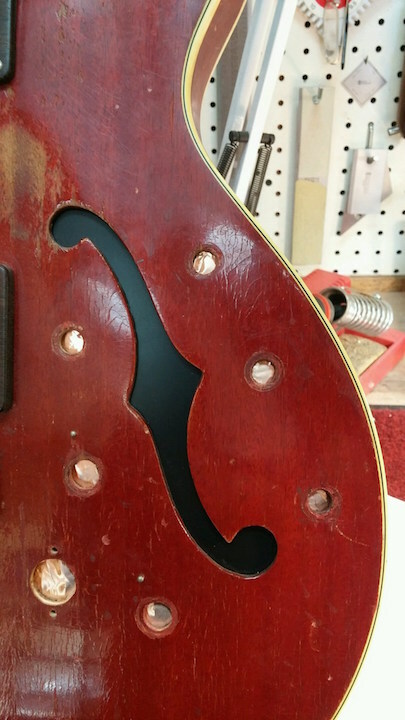 I had to remove the pickup selector switch, since it's so far toward the horn and it's just hard to get things arranged in that part of the cavity, but I think if I spend some more time on it, I should be able to get it together. Maybe I can even go back to the old pickups! I really get why Alembic uses the silver stuff. It works. Could you not fill the instrument with the silver shielding paint then slosh it around a bit to get full coverage? You might want to try some shielding tape. I've used it often with excellent results. I've tried shielding tape and the cover of the access door is covered in shielding tape. The problem is getting complete coverage without making a mess as the stuff is pretty thin and hard to control while applying it through the smallish hole. I'm sure someone with better skills than me could do it, but copper sheeting seemed easier. 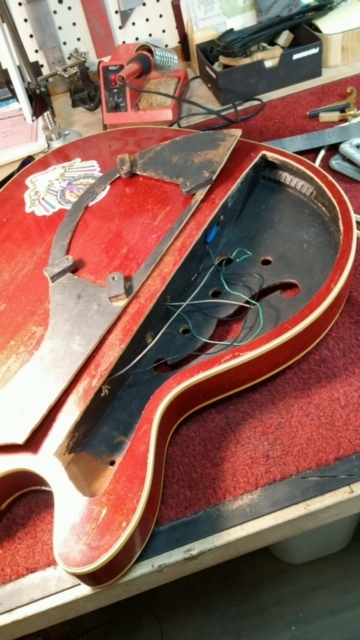 Obviously the best way to go would be to cut a much bigger door and then apply the shielding tape or silver paint, as in Keith's bass. Edwin, maybe you need to find one of those people who make ships in a bottle. That's better than becoming one of those people who make ships in a bottle! At this point, I think I'm going to bring it with me to SF at the beginning of March and drop it off for some mothership love. Sounds like a good idea. Hope we can get that mini-gathering together while you're in town. Or you can open a bottle with those people and become ship faced! If you use multiple bits of copper; Be sure to solder the copper together with solder dabs to get it to all conduct. I don't like copper with tape backing, as it interferes with positioning the sheets. First off, there were various issues of humming and buzzing from the house PA. The venue is about a 600 capacity theater. (I bring a splitter snake and then run in ear monitors from my recording rig, 2 Metric Halo ULN-8s and an RME Octamic D. It allows me to scrutinize all the channels as well as create great in ear mixes.). I am always a little paranoid that my split and recording rig will create issues, but as we went through them, they all proved to be bad mic cables, problems with the FOH console, etc. Weirdly, I had a hum issue with my DS5-R and F2-B in my rack. I didn't really have time to troubleshoot it, so I switched out to the little blue box and used no preamp beyond my Felix, which is also the DI. From there, the signal went to a Showman/Sunn 200S rig with an RE20 on one of the JBLs. Sounded good in the soundcheck and the directional noise was almost absent. At least, the FOH guy never commented on it at all. I still had noise when I got close to my computer/interfaces, but that usually happens. D'oh moment of the night: I couldn't get a good signal from the RE20 off my amp. After the set, I noticed that the send had gotten misrouted during the opening band's set. They also bumped a switch that put one pickup out of phase with the other, but that was easily trouble shot (shooted?). Once that got sorted out for the second set, the tone was great. So, I think if I can close up a few more gaps in the shielding, I may not have to spring for the electronics upgrade. Part of me still wants to have Ron and the crew go through everything, and I'm sure he'd make it even quieter, but finances being what they are.... 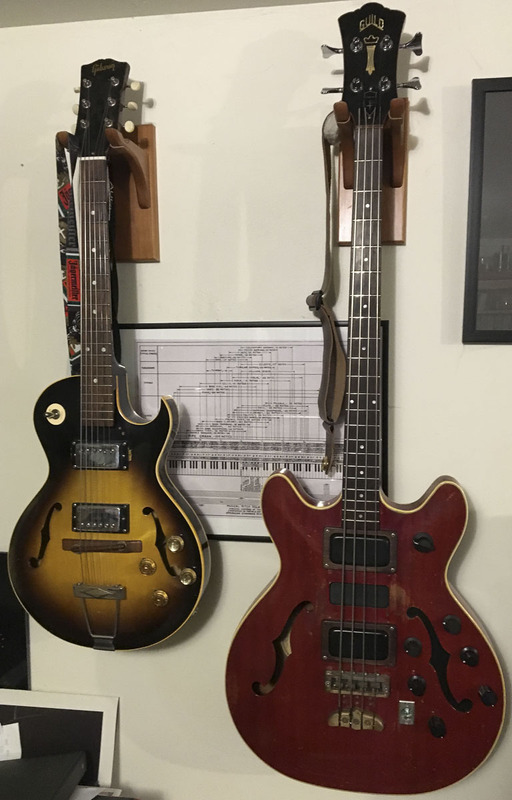 I also have a gig in May covering 5/14/1974, and it would be best to have this bass. Scroll down to the comments to read "Ripplerous'" account of the %#�&@ who threw a bottle that hit Bobby in the face - and the band's magnificent reaction. Here's a great HD pic of Bobby and Phil (from 6/8/74), with a fantastic view of The Godfather and "the Wall." Weather Report Suite, aka Prelude, Part I, and Let It Grow. OK, surgery has started for the new shielding job. When I was visiting Alembic last week Susan commented about how ridiculously expensive the silver paint they use to shield the cavity is. Mica and I both got a laugh out of Graeme's suggestion that you fill the cavity with it and slosh it around. Good idea in theory but that would make for one expensive shielding job. And another couple of shots. Doors within doors! It should be done later today. Then I just have to reinstall the electronics. I've been debating about moving the XLR output to the side of the bass. Or maybe still on the top but closer to the bottom (i.e., where the strap is). Any thoughts about side mounted vs. top mounted jacks? Nice job, Edwin, looks great. I have always prefered top mount jacks. I like to be able to see it when plugging in and taking out the cable, just makes it easier for me to do so. The cable tucked under the strap hangs down the same way with either top or side mount, so that's not an issue. Also, with top mount you don't have to worry about it when you sit down and play. And side mounts often interfere with stands. Thanks for chiming in, Rob and Bill! I'm pretty set on top mount at this point. It's also going to be easier to mount. Shielding all done, with all the various parts tacked together with solder. Now I just have to put all the stuff back in there. Bill.. "And side mounts often interfere with stands. " I hope you don't leave your guitars plugged in when they're on a stand ! I've seen several guitars crash to the ground when clumsy stage hands (and even musicians) have tripped over the cable. I went to see Phil Lesh in the Grate Room at Terrapin Crossroads shortly after he got his medium scale Series II. He was out on stage before the show tweaking his rig. When he finished he put the bass in a stand with cable attached, started to walk away, and caught his foot in the cable. Luckily the bass didn't come crashing down but he had a less than pleased expression on his face. Strangely he just left it the way it was and didn't remove the cable. Beyond the stand issues top mount seems the way to go. Recently I was in a rehearsal studio where someone stepped on the 1/4" line out jack of a synth keyboard to the amplifier ( it was not the keyboard player himself) Long story short; as a result of the jack being pulled out by stepping on it there was resulting damage to the PCB mount 1/4 jack. I quickly saved the rehearsal by taking a feed from the keyboard's XLR balanced out instead. The resulting damage was not an inexpensive repair ! Weirdly, when I put everything back in, somehow the outputs are shorted to ground. I'm having a hard time figuring out where. This is happening even with the preamp card disconnected. I'm sort of wondering if some piece of metal got into the pickup selector switch. I'm hoping to figure this out soon! OK, all back up and running. The noise is significantly less, so mission accomplished. I'll post photos of the reassembled bass soon. Great news about the noise...that's gonna be nice. Well, even more noise reduction accomplished. After talking to Ron, it became obvious that the hum canceler had to come out front, so Mike from Woodsongs routed a nice hole in there. Ron also informed me that grounding the cover via a wire is trouble, because of its width to length ration, it can act as an inductor, so I got rid of that and installed tabs of copper shielding. Got it home, tuned in the hum canceler to the best balance with the other pickups and it was indeed much quieter. It would be barely noticeable in a mix, even from a recording made sitting in my basement studio in front of the computer, etc. Then came the leap of faith. Ron told me that the big problem with having the humcanceler in the body was all the shielding around it. While shielding protects the wiring, it also, as far as I can understand the brilliant mind of Mr. W., disperses the radiating fields of electromagnetism floating around in a very disruptive way so that the humcanceler is seeing a very different EM field than the pickups are. In fact, any metal does this, it doesn't have to be shielding, connected to any part of the circuit or otherwise have an electronic function. Even bridges, metal battery covers, etc., do this. 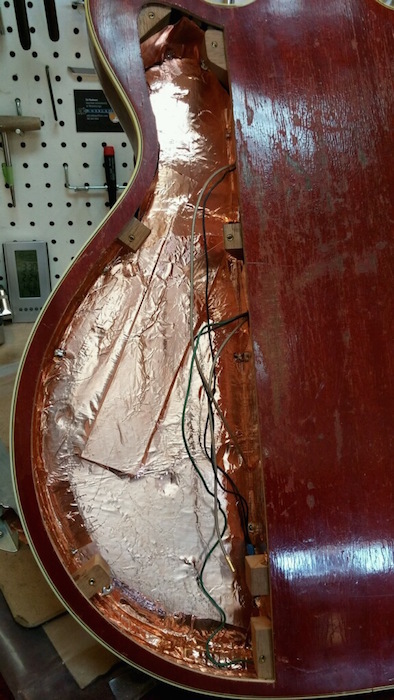 What does it less than the copper shielding inside my bass is, wait for it, silver paint! Silver paint does its job as a shield but is thin enough that it doesn't create havoc from ambient fields. So, armed with that knowledge, I decided to see if I could take things a step further. 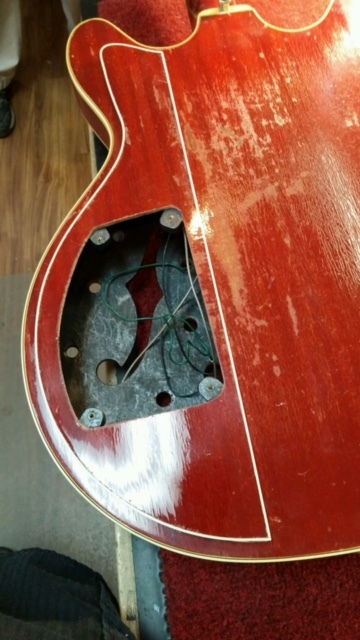 The luthier, Matt at Woodsongs, who had installed my Alembic pickups had very carefully, and with a large amount of skill, had shielding the pickup cavities. It was a thing of beauty. But, heeding the words of Ron, I yanked all that stuff out of there. I'll be, well, you know what, if it isn't even quieter still! Removing shielding to decrease noise seems counterintuitive, but in this scenario (since the pickups are already shielded), it really made an audible difference. I'll have to post a picture of the front. Next experiment at another time: try out the old pickups. The new humcanceler is there to stay, but apparently it should work. Much gratitude to Ron, and James, and Mica, and Susan, and Mary, and all of them. It is a wondrous thing they've got going on there. Interesting about the ground strap. I recall a noise conundrum Ron solved by cutting some brass pickup rings so they weren't loops.Another example of unexpected induction I guess. this is such a beautifull bass! Nice job on the routing, looks great! I see you covered up one of the f-holes. Was that to control feedback? If so, why only one hole and is it effective? Edwin, also, are each of the pickups and the hum cancel pickup in their own compartments and isolated from the other electronics in the larger compartment? Thanks! Each pickup has its own rout, but the routs are not shielded. The pickups themselves have all the shielding they need. Noise actually decreased when I took the shielding out of the pickup cavities. Or maybe I don't understand the question. Bass looks great. Cosmetically I like having the hum canceler visible and the new pickup selector knob looks much better, too. Interesting that trying to shield the instrument resulted in more, not less, noise. 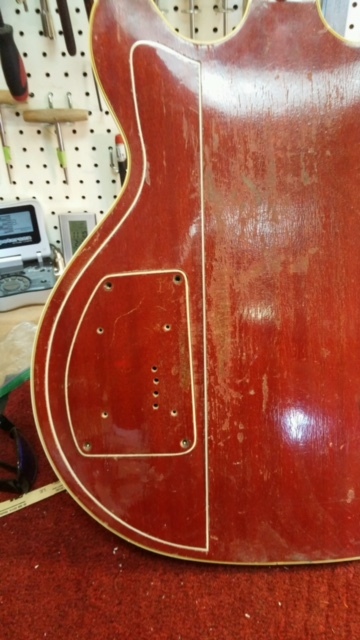 Your description of the process makes it easier to understand why Ron has to fine tune the electronics in each bass after the hardware is installed. Bringing her back to CA in May? Looks good - but with the hum-x up front, where will you put the quad p/up??? Why, piezos in the bridge, of course! Actually, stereo is good enough for me.